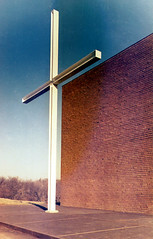 The free-standing steel cross is one of the critical elements of Armstrong's design that suffered due to budget constraints. The third design featured an extruded crucifix that strongly modulated the entry experience. By being physically detached from the structure, the cross became a more purely sculptural signpost indicating to those driving by that this cubic block of brick was a christian church. Exterior articulation of the structure was reduced to a great extent, unfortunately diminishing it's sense of the human scale.